Just over a year ago we did a guide looking at how to do screen shots with the Samsung Galaxy S2, now however the Galaxy S2 has been over taken as the Samsung flagship device by the Galaxy S3, the new Samsung super phone. We thought it would make sense to a similar guide to explain how to take screen shots (also known as "screen captures" or "print screens" with a Samsung Galaxy S3. something like their homescreen or a screen that has something interesting on (perhaps high battery use or odd data use), for this example we're using a home screen. 1-On the status bar you will see a message saying "Saving screenshot..."
2-A second or so later a massage on the lower part of the screen will show "Copied to clip board"
After these messages you will be able to find your screenshots saved in the "Gallery" app in a folder called "Screenshots". Note-For people who used the Samsung Galaxy S2 with Gingerbread, the technique is almost identical. 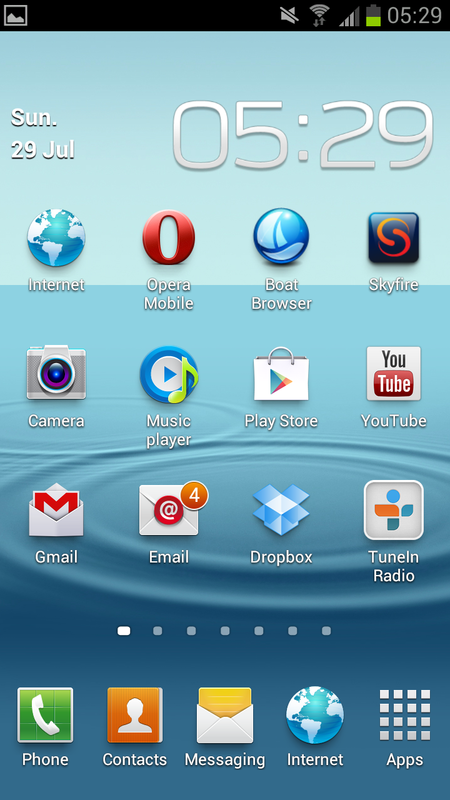 If however you used the Samsung Galaxy S2 with the updated updated Ice Cream Sandwich (ICS) the technique is widely different.